Today we took a flight from Ercan Airport in the Turkish Republic of Cyprus to Turkey. Flying from Greece to Cyprus it was necessary to fly to Larnaca on the southern coast. Flights from Larnaca do not go to Turkey, and flights from Ercan do not go to Greece. Let’s put that aside for now. The flight from Cyprus to Antalya (biblical Attalia) took about 45 minutes. I thought some about how Paul, Barnabas, and John Mark made their way from Paphos on Cyprus to Perga in Pamphylia (a few miles from the Antalya airport). The distance in a straight line is 185 miles. Here is Luke’s account of the journey. There are impressive Hellenistic and Roman ruins at Perga. Most of the Roman structures date to the second century A.D. This is where John Mark turned back from the work (Acts 13:13-14; 15:37-39). The text indicates that Perga was only a beginning point for work further north. On his return from the first journey, Paul spent some time preaching here (Acts 14:25). 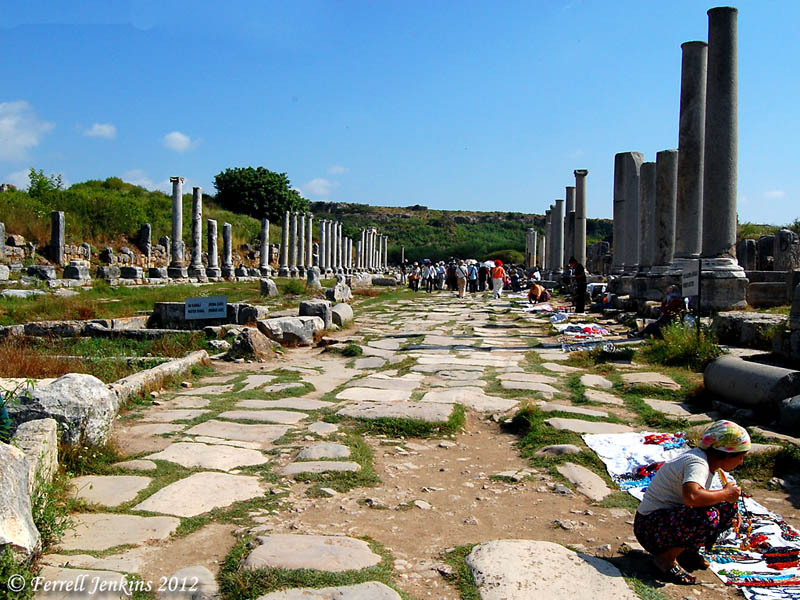 Our plans do not include revisiting sites that we have recently visited, but here is a photo of the North-South street in the Agora of Perga. The view is toward the fountain at the head of the street. A local vendor spreads out her jewelry on the ancient street. N-S street in the Perga agora with view toward the fountain. Photo by Ferrell Jenkins. When we arrived at the Antalya International Airport I soon realized that we had come to the right place. The snack stand was named Cafe Pampilya. How appropriate. 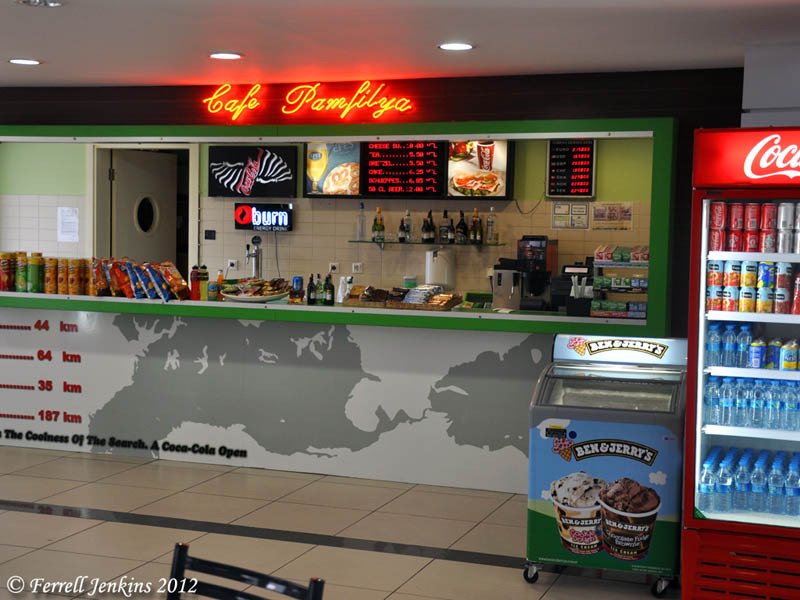 Cafe Pamfilya in the Antalya International Airport. Photo by Ferrell Jenkins. Tonight we are staying on the Mediterranean Sea on the west side of Antalya (Acts 14:25). 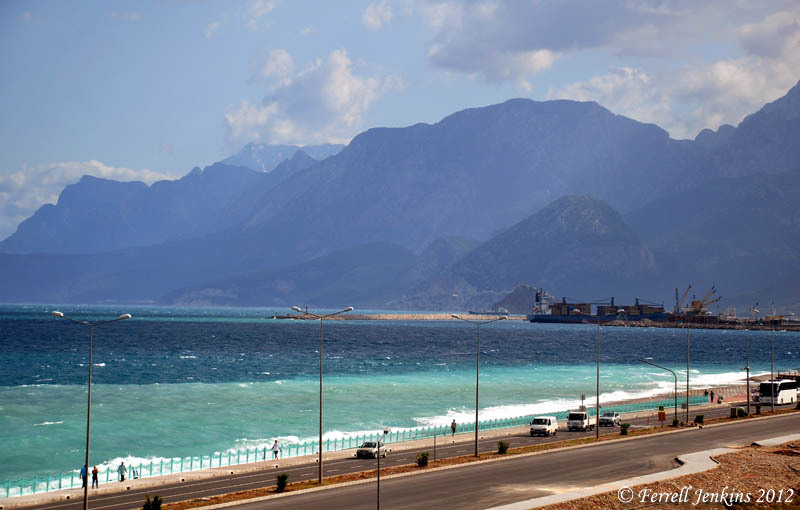 Antalya is the modern name for Attalia which served as the port of entry from Egypt and Syria to the interior of Asia. From here Paul sailed back to Antioch (Acts 14:25). We have a nice view of the Lycian Mountains from our hotel balcony. Tomorrow we plan to drive along the coast to Myra (Acts 27:5) and other points west. Lycian Mountains west of Antalya, Turkey. Photo by Ferrell Jenkins. Two week ago when I was in Turkey with the group, it was about 5-7 degrees warmer than usual. Today it has rained and the wind is cool. A post I wrote about Perga and Attalia in 2007, in the early days of this blog, may be read here. This entry was posted in Archaeology, Bible Places, Bible Study, blog, New Testament, Photography, Travel, Turkey and tagged Apostle Paul, weather. Bookmark the permalink. You point out that “Paul, Barnabas, and John Mark made their way from Paphos on Cyprus to Perga in Pamphylia,” which of course is correct. But as Perga is a bit inland from the sea, and Attalia was/is a port, I have pretty much assumed that as they traveled from Cyprus, the three men arrived *first at Attalia* and then went to Perga, and so toward Galatia. Why would not Luke have mentioned Attalia? I suppose the omission is due to the fact that in this part of the journey neither Attalia nor Perga were important to be mentioned, except for the fact that it was in Perga that John Mark turned back; thus it wins a mention. Does that seem to be sound reasoning to you? Would any ship delivering goods to Perga have ported at Attalia, or was there a closer port?